It took almost a month to get to see the dermatologist at Children’s Hospital and even though it was a long wait, I was not worried about Santi’s skin condition. The spots did not seem to bother him at all and his acid reflux was by far more annoying to him. 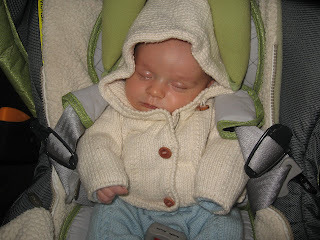 He had a very hard time latching and breastfeeding became a nightmare time for both of us. Then Thanksgiving arrived, and we hosted our first dinner and had out-of town family staying with us. With so many things happening, the new spots that Santi developed in his head, legs and back were not that concerning to me. I was sure they had to be some sort of allergy (my husband’ side is prominent to have all sort of allergies) and the opinion of our pediatrician’s colleague was not one from a specialist. Plus, we spent a whole Sunday looking at pictures of kid skin conditions on the internet and nothing, absolutely nothing, looked like the spots that Santi had! On the day of the appointment, I told my husband that it was not necessary that he came with us (he already missed a few hours of work due to other doctor visits) and I thought that the most that could happen was that the dermatologist would prescribe a lotion for the spots. Our Children Hospital is a teaching hospital, so if you watch “Grey’s Anatomy” that is exactly the type of feeling you get. First, we had a young doctor, “George O’Malley”, who introduced himself as a resident and checked Santi’s spots. He said that he was pretty sure he could identify what Santiago had and that it was not dangerous. He also mentioned that Santi’s bump was not a bump but a lesion of the same condition. I was so relieved that he recognized the spots so quickly! A few seconds later, Dr. Patricia Witman (the equivalent of McDreamy"), came and checked the marks and agreed with George’s assessment. She was 90% certain that my baby had “Juvenile Xanthogranuloma” (JXG), a rare and benign disorder typical in babies and young children, that usually goes away in 3 to 5 years and whose lesions tend to disappear on their own, without any kind of treatment. What? What did she say? I was in shocked, happy and upset, at the same time. Glad to hear it was nothing dangerous and distress that our pediatrician’s colleague was right! But that was not the end of the surprising news, Dr. Witman told me that unfortunately, JXG belongs to a family of diseases called “Histiocytoses” where there are too many histiocyte cells in the skin. Normal histiocyte cells are part of the immune system, alerting infection-fighting cells to the presence of foreign material such as bacteria However, some of these histiocytosis were not benign and the only way to know what type Santiago had with 100% of certainty was by biopsy. From that moment on, I was in “auto pilot mode” and I stopped feeling anything. I agreed to the biopsy to be performed right away and also that my baby’s lesions would be photographed for teaching purposes and to have a base line of his condition. George performed the biopsy very quickly and besides the initial stain of the anesthesia shot, Santi did not feel pain. Of course to see my 9 week old baby, laying on the medical bed while crying at the top of his longs was devastating and I had tears coming down from my eyes during the whole procedure. I regretted so much to have told my husband not to come. Once the skin sample was removed, “Dr. O’Malley” closed the wound with one stitch and told us that the results would be ready in 2weeks…more waiting ahead!